We didn't know what to expect. 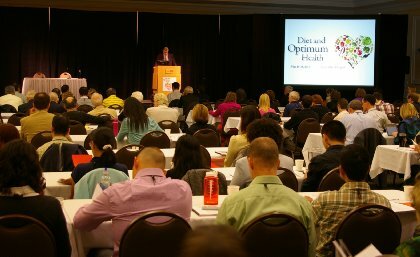 This was our first time attending the Diet and Optimum Health Conference at The Linus Pauling Institute on the campus of Oregon State University. They only hold this event every two years. We had the agenda, but translating that to real life without a frame of reference left the two of us in doubt. We arrived the night before the event began. We stayed with one of Peg's P.E.O. sisters. (P.E.O is an international women's group that raises money for scholarships, grants and loans for women's post secondary education). A donation was made to her chapter for our five night stay. We had a lovely time with our hosts. 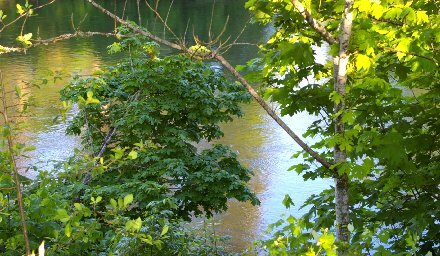 Their home was tucked in below the foothills on the edge of town. We saw deer and circling hawks throughout our stay. OSU is located in Corvallis, Oregon. We thought we were very familiar with Corvallis, but the fourth or fifth time we got lost, we decided we weren't quite as familiar as we thought. With Google Maps and Mapquest online, it seems like nobody sells maps anymore. For the sessions from Wednesday to Friday, rows of tables were set up so that people could see the speakers and their slides as they took notes. Microphones were positioned on either side of the auditorium for questions. When researchers reveal new information there are always questions. 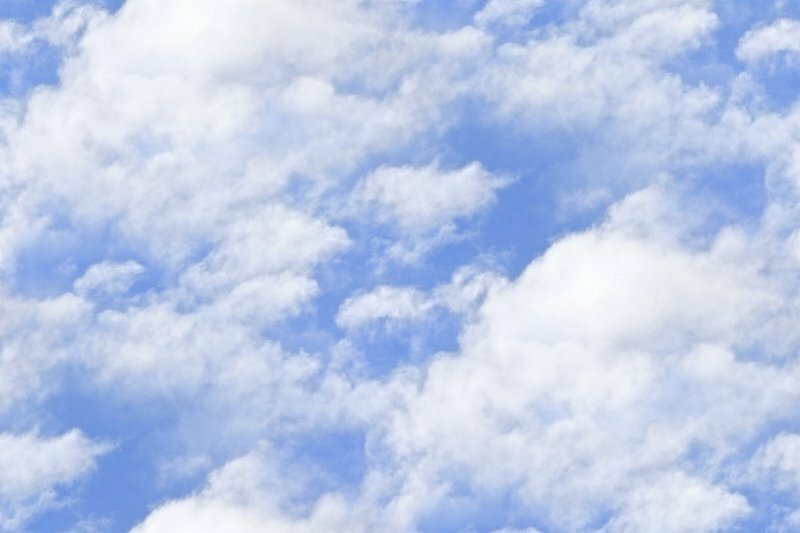 Sometimes clarification was asked, and sometimes different viewpoints were revealed. I loved the Q&A. LPI distributed an excellent booklet with a page and sometimes two explaining who the researchers were, their credentials, and the scope of their presentation. They came from all over the U.S. and the world. Each presenter had slides to share on screens set up on either sides of the stage. Quite often the material was beyond us, but with the booklet and the slides we were able to digest some of the information and plan a series of follow-up articles. We made personal contact with many of the presenters and will correspond with them as we develop the articles. 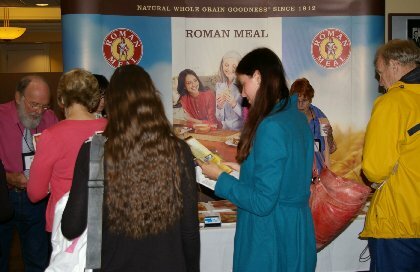 Live2AgeWell shared a booth with Roman Meal. Roman Meal donates to the LPI research program for healthy aging. We write about healthy aging. 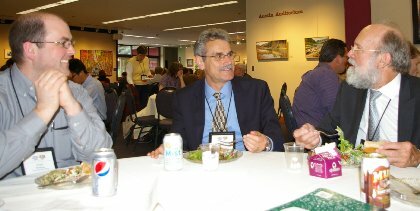 The disappointment of the conference was that Roman Meal Chairman of the Board, Charles Matthaei was unable to attend. He had been looking forward to the event for some time. For lunch on Thursday we all met with Balz Frei, Ph.D. Director, Linus Pauling Institute, and Michele Erickson, LPI Director of Development. Peter Matthaei of North Dakota Specialty Milling, and Dr. Patrick Finney of Roman Meal, Senior Scientist and Vice President of Product Innovation talked with Dr. Frei about possible new products and then Balz asked us a number of questions about Live2AgeWell. We were surprised by the interest and happy to respond and share our progress. The next afternoon we had lunch with LPI researchers. We had read information from them in their researches and had even quoted most of them in our articles but meeting them was a treat. 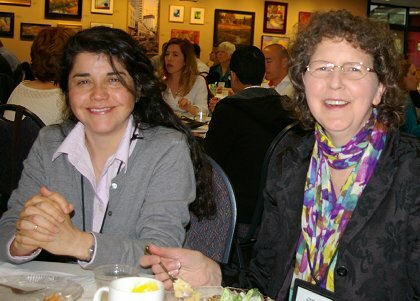 Viviana Perez (the Naked Mole Rat and lifespan expert) and Kathy Magnuson had to leave lunch early to set up for a presentation. Fritz Gombart, Tory Hagen, and David Williams stayed and talked for quite a while before they too had to return to the duties of the conference. When they left, Patrick and I stayed in the empty hall and talked about the conference. That gave us a chance to relax and reflect. While at the conference, the Roman Meal and Live2agewell team had the opportunity to take a mini tour of the LPI building and to meet some researchers at a reception. We also visited the OSU Library. 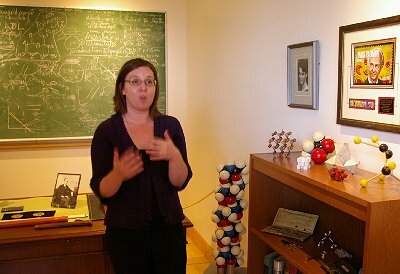 A main feature is a room dedicated to Linus Pauling's actual office, including his furniture: desk, chalk board (intact as he left it with his writing of notes and equations unprotected), bookcases, molecule models (that he created himself) and toys. It was such fun to see his work environment. Both Peg and I have toys on our desks, too. They are creative tools of the mind. We also visited a Moore Family Center class, devoted to Public Health and Human Sciences, to see how students were learning during a hands-on nutrition and cooking class. Friday evening there was a recognition and award ceremony for the 2013 Linus Pauling Institute Prize for Health Research presented to Dr. Helmut Sies, from the Heinrich Heine University of Düsseldorf in Germany. 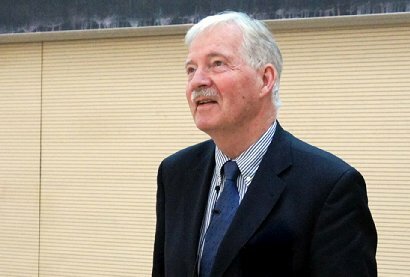 The Linus Pauling Institute Prize is one of the leading honors of its type in the world. The prize also recognizes successful efforts to disseminate and implement knowledge on diet, lifestyle, and health to enhance public health and reduce suffering from disease. Sies is a pioneer in the study of carotenoids and flavonoids. The Saturday session was open to the public. Gone were the tables in the assembly hall and instead were hundreds of chairs. The focus was general information on health and nutrition. Again, there were presentations and Q&A. I'm guessing that there were about 250 researchers and scientists during the week. Some of them stayed over for the Saturday session and join probably another couple of hundred interested visitors. I recorded a long interview with Rhoda Hall for her community radio program at OSU and had fun talking with other LPI people and guests. Being attentive, inquisitive, and friendly for four days in a row is hard work. We did have a chance to relax a little bit; Peg and Shawna LeMott took a break and went shopping in 'downtown' Corvallis and Peg and I had dinner on our own. Corvallis is a beautiful college town, and has excellent food and wonderful places to walk and see. We dined at del Alma. The tapas food was impressive. 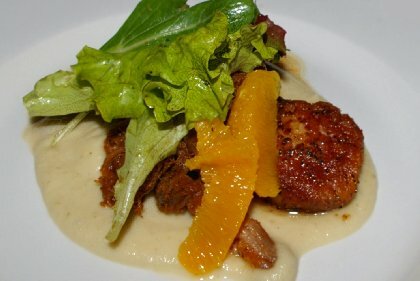 Our favorite dishes were the scallops and pulled pork with a parsnip puree. When we eat there again, I think I'll order two dishes of the scallops. The puree was really good, but I could have done without the pork, which is strange because I love pork. It's just that the scallops over-shadowed almost everything else. We also loved the beets with a spicy marmalade. We will have to try that taste pairing at home. We would heartily recommend the 2015 conference to anyone deeply concerned with food, diet, and nutrition. It will be an excellent place to learn about the latest cutting-edge studies . . . and meet the people who are conducting the research. 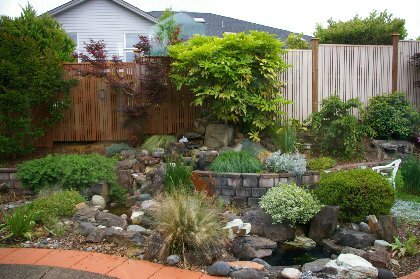 Corvallis is a great place to stay for a relaxing and working vacation. The conference offers an opportunity to learn, to question, and to share. Do you have any questions about this article, comments about our content, or suggestions for what subjects you would like addressed in the future' Please, ask away. 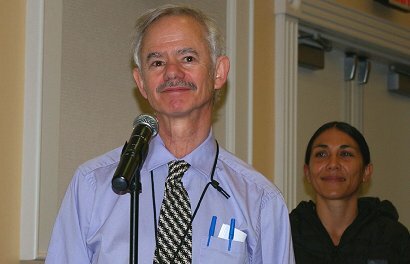 Diet and Optimum Health 2013, nutrition conference, nutrition information, free nutrition content article, Healthy Aging Article, Healthy Living Article.